Coffee enthusiasts, like us, can smell good coffee even from a mile radius. We stick to freshly ground beans over pre-ground beans at every possible turn. The fresh-flavor it adds to a cup is unique and unbeatable. You either have to place your grinder and brewer side by side, or simply buy yourself a two-in-one. If you prefer the latter, then you’ve come to the right place. 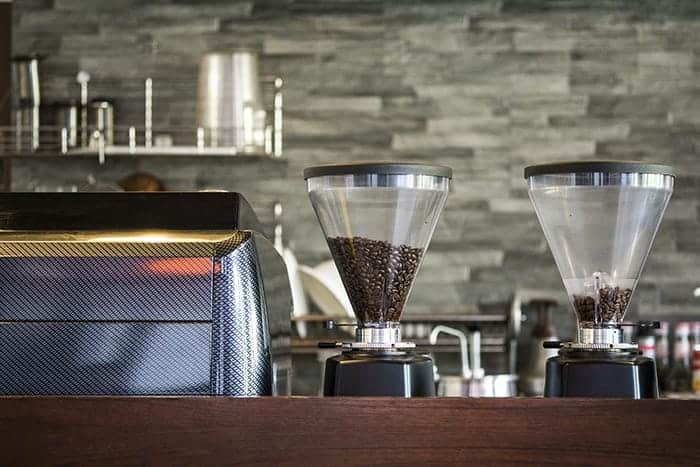 Coffee makers with grinders are space-saving units that combine grinding and brewing into a single process instead of two. They have many bells and whistles to go with too, which make most of them highly convenient and a snap to operate. In this review, we’ve narrowed down your hunt for the best coffee maker with grinder through extensive research and tests. Each excels at many things, and ultimately bring you the best bang for your buck. Scroll down to reveal what they are! Brews a fresh cup of Joe with fresh beans every time. 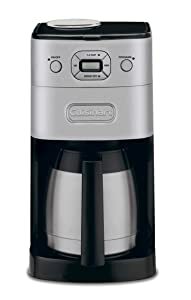 Cuisinart Burr Grind and Brew Thermal Coffeemaker is a 24-hour programmable machine that combines the ease of grinding in a drip coffee maker – ensuring you savor the taste of your cup of joe from freshly ground coffee beans. To the credit of newbies, the machine is pretty easy to operate. Once you fill up the reservoir and put beans to grind, the manual will guide you till the end. The strength controls and grind control options are great as well. They allow you to customize your brew even through trial and error – until you perfect the taste unique to your tongue. The package includes a 12-cup thermal carafe. It not only helps you brew an entire pot, but also keep it hot for a couple of hours – as an attempt to make up for the lack of a hot plate. This machine may save you time through fast grinding and brewing, but you’re going to waste more time by trying to get it cleaned. Cleaning the chute is the hardest of all, requiring the aid of a fine brush which is not provided. 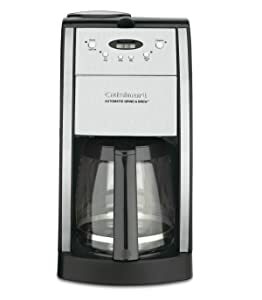 If you can overlook the hassle related to cleaning, then the Cuisinart Burr Grind and Brew Thermal Coffeemaker can be recommended with a thumbs-up. Simply follow the manual, customize and program your cup to be poured even before you leave the warmth of your bed! A powerful beastly machine made to brew your personalized cup. On so many levels, Breville BES870XL is a dream-come-true. The price is what pulls you initially, but you’ll soon realize that the functionality outweighs the price. To start off with, it’s semi-automated. You can’t simply cross your arms and wait for it to fix your cup. Instead you need to get your hands busy, by heart the instruction manual, and get going. If you haven’t owned a coffee maker with grinder before, then all the dials on the face of the machine may intimidate you a little. But be rest assured that it’s not what it seems, and you’d be able to get a hang of it right after a few uses. Semi automation also stands for ‘your cup is customizable.’ Everything from ﻿﻿grind dosage to grind fineness, water temperature, and tamp pressure can be experimented and set up to your personal standards so that you can always, always have your definition of The Best Espresso. Clocking in at 13.2 x 12.5 x 15.8 inches, and weighing about 23 pounds, this machine is bulkier than most. But that’s what makes it solid, durable and long-lasting compared to space-serving models. All the extra weight and stainless steel parts make it a tad loud. We wish the manufacturers could focus on noise insulation but then we need to be realistic from a low price point. 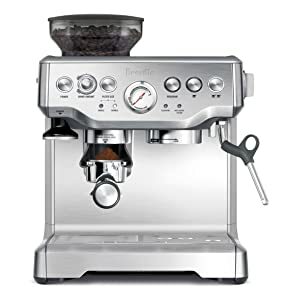 If you don’t have a little bit of time to spare in making a perfect cup of espresso from freshly ground beans, then Breville BES870XL is not for you. However, it makes it up to you by saving time in cleaning and tasting heavenly. Coffee for two? Coffee for guests? Anything is possible with Cuisinart DGB-650BC. Cuisinart DGB-650BC is the junior version of DGB-900BC, boasting similar features yet at a tad smaller size. It combines the ease of grinding with a clear control panel, and easy-to-follow instructions that’ll leave no room for complaints. Though advertised to brew 10 cups at time, it can go about brewing in smaller quantities between 1-4 cups as well. The good news is that even for smaller quantities, neither the strength nor the coffee quality will be compromised. The 24-hour programmability ensures you wake up to the sweet aroma of a customized cup. For this purpose alone, you’ll be provided with a double-walled thermal carafe that can keep coffee warm for a couple of hours straight. The construction quality of Cuisinart DGB-650BC Grind-and-Brew has earned many praises as well. It’s robust and surprisingly more rugged than its rivals. We liked how it shuts off automatically and can be paused to sneak a cup without having to wait until it fixes coffee for the rest of the household. Similar to the other models in the Cuisinart Grind-and-Brew line, this one too, is a pain to clean. It has altogether 5 pieces that need constant cleaning for an uninterrupted brewing process. But keep in mind that some level of cleaning is expected in all types of coffee brewers with a built-in grinder. Cuisinart DGB-650BC Grind-and-Brew is an excellent choice to consider for those looking for a brewer with a built-in grinder. It’s also tinier than most, making it a great choice for kitchens with a limited space. All in all, it gives a good return on your investment. A wonderful machine at a wonderful price. Getting both a grinder and coffee-maker for less than 100 is a steal. Let’s be realistic. You can’t expect it to be a high-quality unit with stainless steel exterior. So make sure you expect it to have good-quality plastic on a few places and a lifespan of not more than a couple of years. Let’s sneak a quick peek at what Cuisinart DGB-550BK is all about. It is capable of brewing a delightful cup right out of freshly ground beans. You can also use pre-ground coffee by simply turning off the grinding function. It’s programmable. Meaning – you can set it up to brew coffee on its own without even lifting a finger! 12 cups can be brewed back-to back, but a cup for one or two is still possible through the 1-4 cup brew function. The basic difference between this model and the previous models of Cuisinart is that it comes with a glass carafe instead of a thermal one. But the glass carafe has a hot plate. Though not energy-efficient, it’ll keep coffee hot for about 2 hours before the automatic shut-off system of the machine kicks in. On a difficulty scale of 1 to 10, cleaning this machine can initially be rated 7 and higher once you get a hang of it. Just make sure you rinse specially the grinder clean after every use. This would help you avoid build-up that’ll clog and shorten the longevity of the machine. The manufacturers advertise Cuisinart DGB-550BK to be used as an alarm. Yes - they can’t be more right because the grinding process is definitely going to wake you up! But thankfully, it lasts only for a few tolerable seconds. Cuisinart DGB-550BK is indeed a terrific machine that will surely leave you nothing more to ask for. In fact, it’s the only effective programmable brewer with a grinder and glass carafe under 100 bucks. To make things even better, you get a limited 3-year warranty to secure your purchase. For a lasting-lasting purchase with the best output – Get DeLonghi ESAM3300. If the taste of your coffee matters to you like your next breath, then DeLonghi ESAM3300 Magnifica is indeed a magnificent option available to you. It can brew you a variety of coffee including espressos and Americanos – at the touch of a button. It comes equipped with multiple settings, including settings for concentration and amount of liquid. They help you customize your espresso until you reach just the perfect texture. The unique cappuccino system is patented as well, and rotates 180 degrees – accommodating milk containers of any size. Unlike most other coffee machines, DeLonghi ESAM3300 Magnifica is a delight to clean. Not only does it feature an automatic descaling indicator, but also easily-removable parts that make the entire process of daily-cleaning less painful. If there’s one thing holding you back from hitting the ‘buy’ button, then it could only be the price. But let us tell you that this is definitely one of the top models to have ever hit the market, and the price is entirely justifiable. It’s well worth splurging a little on. 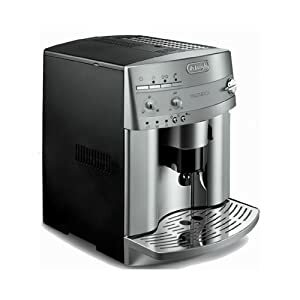 DeLonghi ESAM3300 Magnifica is an ideal espresso machine for any household as it’s compact and stylish enough to blend right in with most kitchen decor. Apart from the obvious reasons for recommending it, such as the taste of the brew, it’s backed by a generous 2-year warranty. All in all, DeLonghi ESAM3300 Magnifica is definitely worth checking out. One of the major selling points of Capresso CoffeeTeam TS is that it does exactly what it promises to do – i.e. making great coffee. With multiple settings to adjust the flavor and strength of the brew, even the ones who enjoy dark-roast coffee can have a great fix. After all, you paid for all those extra buttons, so put them to use. The programmability of this machine is definitely a plus as well. It can be set up to brew you wake-up coffee, or off-work coffee that you might often feel too lazy to brew. Capresso CoffeeTeam TS is built with high-grade materials that it may even seem bullet-proof. So longevity isn’t going to be an issue. When this unit sets to work, you’ll have to get ready to sacrifice your sleep for a good cup of joe. You guessed it right – it’s loud. And the process lasts for a few seconds longer than an average grinder. But be rest assured that the grinder does a job well done, with 5 delightful fineness settings. So the noise is a justifiable trade-off. We’ve heard another minor gripe coming from the bean basket as it is considered to have a low capacity – needing frequent refills. However, it’s not a deal breaker for loners and couples who don’t brew an entire carafe at a time. 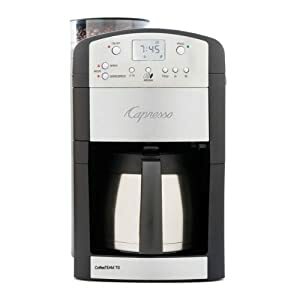 For those looking for a manual drip coffee maker that combines the ease of brewing and grinding in one convenient machine, then Capresso CoffeeTeam TS is a viable purchase to consider. Breville BDC650BSS comes from one of the well-established and reliable brands in the industry. However, what makes this model with a built-in Burr grinder stand out from similar models is its customizability. The grinder, on the other hand, has 6 different fineness settings and is programmable. This enables you to brew up to 12 cups at a time – without even lifting a finger! The drip tray is removable, making room to accommodate travel mugs of varying sizes. This includes mugs even as tall as 7.5 inches. 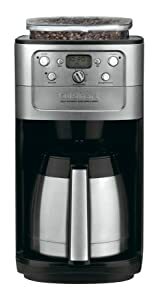 It accepts pre-ground coffee as well, which means you can use flavored coffee beans from your favorite brand. All you need is to select the ‘Pre-Ground’ mode and bypass the grinder – You’d be good to go. Using flavored coffee will accumulate more oils, which can clog up the system and shorten the lifespan of this machine. So make sure you stick to a frequent and thorough cleaning schedule. Speaking of cleaning, it’s as straightforward as it gets and you’ll eventually fall into step with it. Daily cleaning of the filter is highly essential because it can clog up and weaken your coffee. 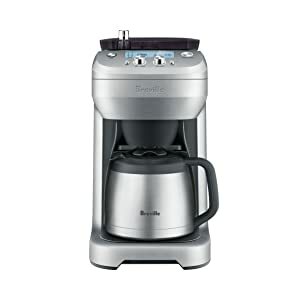 Famed for its customizability, Breville BDC650BSS is a master at brewing a flavorful pot of coffee. It boasts many bells and whistles too, and is built to serve you for many years to come. That's all our top picks of coffee machines with built in grinders. Do let us know what's your favorite machine. I have that Mill and Brew from Black and Decker. Was $50 at BestBuy and super easy to clean, but not the water tank does not come off 🙁 The rest is easy to clean and have had it a couple years now. Will buy another when that one breaks. Screw paying up to 4 x the money when that B and D does everything these ones can! Thanks for the feedback. We will do a retest. I’m not a coffee snob, but would like a nice espresso and Americano coffee set as I do have European friends who will visit me in the US. I loved the review of your #2 Breville espresso machine. Will it makes regular coffee (An Americano?)? I found this site very helpful! Thanks! I’m all in on the DeLonghi ESAM3300 Magnifica Super-Automatic. I’m tired of going to Starbucks everyday…for the last 9 years. Unless there is a better one out there for lattes. Excellent list, thank you for all the detail. Had some models on here no one else mentioned on other sites!